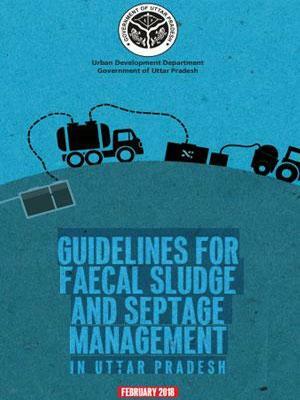 The draft FSSM guidelines are prepared by CSE on request from DoUD, Uttar Pradesh as part of technical support on mainstreaming citywide sanitation and effective Septage Management in town/cities of Uttar Pradesh. In addition, CSE is supporting 4 flagship city’s in Uttar Pradesh - Bijnor, Ramnagar, Gangaghat and Chunar in journey beyond ODF as envisaged unde SBM ( Urban) for target town/ cities. We will also develop model City Sanitation Plans for Bijnor (and Bodhgaya in Bihar) to provide a framework for town and cities in planning for sustainable citywide sanitation. According to Census 2011, Uttar Pradesh reported 44.47 million urban population i.e. 22.28% of total population of state living in 914 urban centers (which accounts 11.79% of total urban population of country). The state has 647 statutory towns i.e. is 16% of total number 4041 towns in country remaining are 267 census towns. The state has 635 urban local bodies (ULBs) including 16 Municipal Corporations (Nagar Nigam), 197 Nagar Palika Parishads and 424 Gram Panchayats. State ULBs with limited local resources and state support is responsible for provision of municipal services. A sanitation snapshot of urban Uttar Pradesh in Table 1 clearly indicates that in the state households with septic tank based sanitation systems (47%) far exceed those with sewer connections (28%). The State Annual Action Plan (SAAP) for FY: 2016 -17 of Uttar Pradesh under the Atal Mission for Rejuvenation and Urban Transformation (AMRUT) reported a sewerage network ranging from 30% to 0.5% for the UP Nagar Palika Parishads. Efficiency in collection and treatment of sewerage has been reported in less than 60% for the corporation cities. Out of the 61 AMRUT cities, 34 have reported zero efficiency regarding collection and treatment of sewage. 12 large cities’ Municipal Corporations (Aligarh, Agra, Bareilly, Ghaziabad, Gorakhpur, Jhansi, Kanpur, Lucknow, Varanasi, Muradabad, Meerut, Allahbad) are preparing City Sanitation Plan with support from Ministry of Housing and Urban Affairs, World Bank, JICA and GIZ. In addition, 4 small and medium towns’ Nagar Pallika Parishads namely Ramnagar, Chunar, Bijnore and Gangaghat are being supported by Centre for Science and Environment (CSE) in preparing City Sanitation Plan and effective Faecal Sludge / Septage Management Plan. These town and cities are identified flagship cities that could act as model for other urban centers across state to initiate city wide sanitation.